You can store two driver’s seat positions with the driving position memory system. 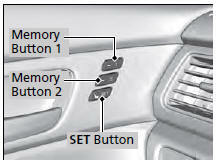 When you unlock and open the driver’s door with a remote, the seat adjusts automatically to one of the two preset positions. The multi-information display* shows you which remote you used to unlock the vehicle when you enter. 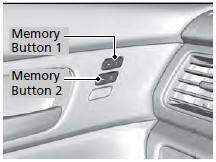 • DRIVER 1 transmitter is linked to memory button 1. 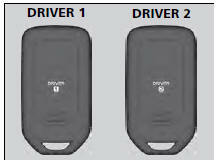 • DRIVER 2 transmitter is linked to memory button 2. Using the audio/information screen or multiinformation display, you can disable the automatic seat adjustment function. 1. Set the power mode to ON. Adjust the driver’s seat to the desired position.<. 2. Press the SET button.<. uYou will hear a beep, and the memory button indicator light will blink.<. 3. Press and hold memory button or within five seconds of pressing the SET button. uOnce the seat position has been memorized, the indicator light on the button you pressed stays on. • You do not press the memory button within five seconds. • You readjust the seat position before the doublebeep. • You set the power mode to any position except ON. 1. Move the shift lever to . 3. Press a memory button ( or ). uYou will hear a beep, and the indicator light will blink. The seat will automatically move to the memorized position. When it has finished moving, you will hear a beep, and the indicator light stays on. • Press the SET button, or a memory button ( or ). • Adjust the seat position. • Shift into any position except .